Performing double valve replacement in a patient with previous pneumonectomy was challenging. Here, we reported a double valve replacement, which is performed in a 60-year-old female with a history of left pneumonectomy via median sternotomy. Multiple cerebral infarctions were confirmed by cranial computed tomography after surgery with none sequela left, which was suspected causing by air embolism. We review literatures from PubMed and conclude that median sternotomy is still the most common surgical approach. Due to the adhesions induced by previous operation, intraoperative air excluding is important for cardiothoracic surgeons to avoid air embolism after surgery. Post-surgery pulmonary hypertension is also worth paying attention to. Long-term follow-up is necessary to assess the outcomes of surgery. Performing Double Valve Replacement (DVR) on a patient with previous pneumonectomy is a challenge, not only for the surgery, but also for the postoperative periods. Pneumonectomy would not only alter the anatomical position in thorax, but also reduce the respiratory reserve since the pulmonary vascular volume was cut by half. Surgical technique of complex cardiac surgery could be alternative, such as median sternotomy, Upper Ministernotomy (UMS) and lateral thoracotomy [1-3]. However, it is controversial which technique is optimal, especially for previous pneumonectomy. Complications of DVR contain prolonged mechanical ventilation, re-intubation, acute kidney injury, cerebrovascular accident, sepsis, atrial fibrillation and so on, let alone with previous pneumonectomy . This report presents a Chinese woman with 30-year history of pneumonectomy who suffered from rheumatic valve disease. A DVR surgery through standard median sternotomy was performed, and she had a transient cerebral infarction postoperatively. A 60-year-old woman was admitted to the cardiac department due to aggravating chest tightness and nocturnal paroxysmal dyspnea. She had a history of bronchial cyst and underwent a left pneumonectomy 30 years ago. Chest Computed Tomography (CT) revealed a pronounced mediastinal shift to the left (Figure 1). Transthoracic echocardiography revealed rheumatic valve disease: severe mitral valve stenosis, moderate aortic valve stenosis, tricuspid regurgitation, and atrial fibrillation. The ejection fraction was 71%. Electrocardiogram showed second-degree atrioventricular block. Pulmonary function indicated moderate restrictive ventilatory dysfunction. Figure 1: Chest computed tomography revealed a pronounced mediastinal shift to the left. A surgery via median sternotomy was performed. The right pleura were kept intact. We mobilized the adhered tissue between the pericardium and left chest wall carefully. After suspending the pericardium rightwards, we got the satisfactory exposure for DVR (Figure 2). With Cardiopulmonary Bypass (CPB) initiated and myocardial protection maintained, two mechanical prostheses were implanted in mitral and aortic valve via interatrial groove and aortic root approach respectively. An Edward MC3 ring was implanted in tricuspid annulus. Heart resuscitated autonomously. The aortic crossclamp time was 71 minutes and the total bypass time was 106 min. Figure 2: Exposure through median sternotomy. On the first day after surgery, the patient felt weakness of her right leg and left arm with stable vital signs. Physical examinations showed reduced myodynamia, level I for the right leg and level II for the left arm, accompanied with shallow left nasolabial groove. 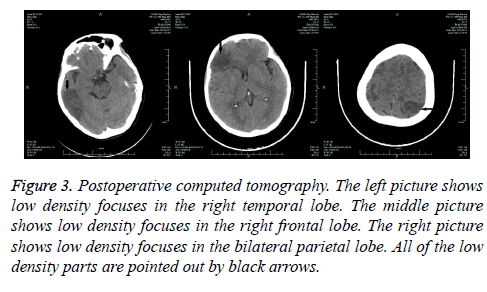 Cranial CT scanning indicated multiple cerebral infarctions in right temporal lobe, right frontal lobe and bilateral parietal lobe, respectively (Figure 3). However, all the neural signs disappeared the next day. The patient was extubated 4 d after the surgery and the remaining recovery was uneventful. Figure 3: Postoperative computed tomography. The left picture shows low density focuses in the right temporal lobe. The middle picture shows low density focuses in the right frontal lobe. The right picture shows low density focuses in the bilateral parietal lobe. All of the low density parts are pointed out by black arrows. During 6 months of follow-up, the patient had none complications and the replaced valves functioned well with LVEF 55% shown by the echocardiography. Cardiac surgeries in patients with previous pneumonectomy were seldom reported. By searching PubMed database, we collected 23 relevant cases from 17 reports since 2001 to 2016 [5-21], and summarized surgical approaches and post-surgery complications briefly. There were 5 patients received Aortic Valve Replacement (AVR), 6 patient received Mitral Valve Replacement (MVR) or mitral valve annuloplasty, and 16 patients received CABG (3 patients underwent concomitant surgeries, and 1 patient underwent surgery twice) with previous pneumonectomy. The most common fatal complication was atrial fibrillation (3/23), and respiratory failure was reported in 1 case. Median sternotomy was still the most common approach. As in our systematic review, it was adopted to 15 of 23 patients as the approach of CABG and/or valve surgery . Median sternotomy could offer a good sight for both CABG and valve replacement, especially MVR. All the MVRs we review here were done via median sternotomy, which is correlated with our conclusion. But in some occasions, when the heart is far away and shifted into one side of chest and the base of the heart is displaced posteriorly, which leads to the plane of the mitral valve is parallel to the surgeon’s line of vision, a transseptal approach is suggested for mitral valve replacement via median sternotomy . Lateral thoracotomy was adopted for CABG and AVR [6,7], thoracotomy could provide satisfactory exposure of aortic root and ascending aorta, as well as coronary arteries. We chose to use median sternotomy, as it could avoid right pulmonary injury and was convenient for cannulation. Although there were tissue adhesions, we found the exposure was good enough for all the procedures. The patient developed cerebral infarction on the first day after surgery. Thromboembolism was usual after valve replacement. It was reported that microthrombi had been observed in 53% of single stenotic aortic valves ; the risk was even higher for mechanical prosthesis . Air embolism was alternative, while the incidence of retained intracardiac air was reported to be 73% after cardiotomy . Mechanical valve  and CPB  could be the sources of micro bubbles leading to air embolism. For our patient, it’s reasonable to consider air embolism rather than thrombus as the culprit of postoperative cerebral infarction, because there were multiple infarctions appeared quickly after surgery with transient symptoms. Though the patient had atrial fibrillation, no evidences of thrombus in the left atrial were found. The apical pericardium was found adhered to chest wall during surgery, thus complete air excluding after DVR was difficult, especially for the apical part. Our case seems to be the first reported post-surgery cerebral infarction ever in patients with previous pneumonectomy who received valve replacement. We would like to advise more attention paid to the air excluding for this sort of patients, and an intraoperative Transesophageal Echocardiography (TEE) was also suggested. The presurgery respiratory reserve is an important prognostic factor for patients who would undergo open cardiac surgery, especially those with previous pneumonectomy. There are many issues need to be raised before surgery, such as avoidance of fluid overload preoperatively, protection of phrenic nerve during the mediastinal dissection, and internal thoracic artery harvesting for coronary artery bypass cases . The operation of DVR could give an advantage for pulmonary artery pressure in long term, but might have an impact on pulmonary circulation perioperatively. Although it’s not clear whether patients with previous pneumonectomy are susceptible to pulmonary hypertension crisis, post-surgery pulmonary artery pressure should be monitored, as the vascular volume reserve is decreased. Studies showed that 36% of participants with previous pneumonectomy turned out to have mild or moderate pulmonary hypertension . To deal with this possible complication, we kept the right pleura intact, protected pulmonary vessels during surgery, and used diuretics to avoid pulmonary edema and reduced pulmonary blood pressure. We observed that the patient had moderate pulmonary hypertension after surgery and gradually fell to normal range 6 months later. This case is a successful attempt that a median sternotomy could be taken as the approach of DVR on patient with previous pneumonectomy. As there might be adhesions induced by previous surgery, intra-surgery air excluding is important. Post-surgery pulmonary hypertension is also worth paying attention to. Long-term follow-up is necessary to assess the outcomes of surgery. Totaro P. Minimally invasive approach for complex cardiac surgery procedures. Ann Thorac Surg 2009; 88: 462-466; discussion 467. Santana O. Outcomes of minimally invasive double valve surgery. J Thorac Dis 2017; 9: 602-606. Qiao Y. Minimally invasive video-assisted double-valve replacement through right anterolateral minithoracotomy. Heart Lung Circ 2014; 23: 847-851. Karimov JH. Surgical treatment of double and triple heart valve disease through a limited single-access right minithoracotomy. Multimed Man Cardiothorac Surg 2010; 2010: 004036. Dag O, Kaygin MA, Arslan U, Kiymaz A, Kahraman N, Erkut B. Mitral valve and coronary artery bypass surgeries 13 years after pneumonectomy for lung cancer. Cardiovasc J Afr 2013; 24: 1-4. Wilhelmi M, Rodt T, Ismail I, Haverich A. Aortic valve replacement via right anterolateral thoracotomy in the case of a patient with extreme mediastinal right-shift following pneumonectomy. J Cardiothorac Surg 2013; 8: 20. Stamou SC, Murphy MC, Kouchoukos NT. Aortic valve replacement and coronary artery bypass via left anterior thoracotomy after previous left pneumonectomy. J Thorac Cardiovasc Surg 2010; 140: 719-720. Us MH, Ugurlucan M, Basaran M, Selimoglu O, Kocailik A. Mitral valve replacement and subaortic membrane resection following pneumonectomy. Case Rep Med 2010; 2010: 480703. Barreda T, Laali M, Dorent R, Acar C. Left thoracotomy for aortic and mitral valve surgery in a case of mediastinal displacement due to pneumonectomy. J Heart Valve Dis 2008; 17: 239-242. Stoller JK. Coronary artery bypass graft and/or valvular operations following prior pneumonectomy-report of four new patients and review of the literature. Chest 2007; 132: 295-301. El-Hamamsy I, Stevens LM, Perrault LP, Carrier M. Right pneumonectomy and thoracoplasty followed by coronary artery bypass grafting and mitral valve replacement. J Thorac Cardiovasc Surg 2003; 125: 215-216. Imoto Y, Sese A, Sakamoto M, Tanaka K, Matsumoto T, Kajiwara T. Mitral valve replacement 41 years after right pneumonectomy. Kyobu Geka 2001; 54: 1087-1090. Fukada Y, Hoshino J, Hirota M, Kondo T, Isomura T. Redo coronary artery bypass grafting after pneumonectomy. Kyobu Geka 2013; 66: 192-195. Ushijima T, Kikuchi Y, Ikeda C, Takata M, Yamamoto Y, Watanabe G. Totally arterial off-pump coronary artery bypass grafting after pneumonectomy. Ann Thorac Cardiovasc Surg 2011; 17: 320-322. Zhao BQ, Chen RK, Song JP. Coronary artery bypass grafting after pneumonectomy. Tex Heart Inst J 2008; 35: 470-471. 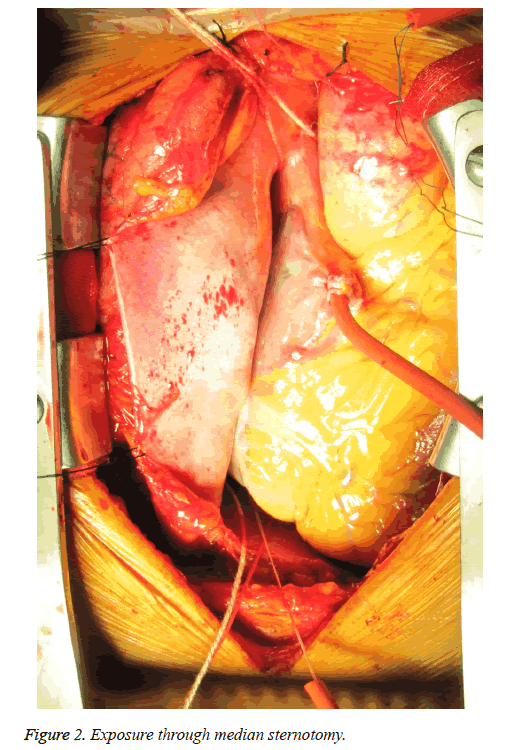 Ghotkar SV, Aerra V, Mediratta N. Cardiac surgery in patients with previous pneumonectomy. J Cardiothorac Surg 2008; 3: 11. Hulusi Us M, Arslan Y, Ozbek C, Basaran M, Yidiz Y, Oğuş T, Işik O. Coronary artery bypass grafting after left pneumonectomy. J Cardiothorac Vasc Anesth 2006; 20: 709-711. Bernet FH, Reineke DC, Grapow MT, Zerkowski HR. OPCAB surgery after right pneumonectomy. J Card Surg 2006; 21: 92-93. Yazicioglu L, Aral A, Uymaz O, Akalin H. Coronary artery bypass surgery in a patient with a functional single lung. Asian Cardiovasc Thorac Ann 2005; 13: 377-379. Shanker VR, Yadav S, Hodge AJ. Coronary artery bypass grafting with valvular heart surgery after pneumonectomy. ANZ J Surg 2005; 75: 88-90. Gölbaşi I, Turkay C, Sahin N, Oz N, Akbulut E, Gulmez H, Bayezid O. Coronary artery bypass grafting nine months after pneumonectomy. Tex Heart Inst J 2001; 28: 146-148. Pleet AB, Massey EW, Vengrow ME. TIA, stroke, and the bicuspid aortic valve. Neurology 1981; 31: 1540-1542. Guerrieri Wolf L, Choudhary BP, Abu-Omar Y, Taggart DP. Solid and gaseous cerebral microembolization after biologic and mechanical aortic valve replacement: investigation with multirange and multifrequency transcranial Doppler ultrasound. J Thorac Cardiovasc Surg 2008; 135: 512-520. Misra, S. and S. Gadhinglajkar, Unexpected air in the left ventricle after aortic cannulation in two patients with severe aortic insufficiency: possible mechanisms and clinical implications. J Cardiothorac Vasc Anesth 2010; 24: 824-827. Barak M, Katz Y. Microbubbles-pathophysiology and clinical implications. Chest 2005; 128: 2918-2932. Schonburg M, Ziegelhoeffer T, Kraus B, Muhling A, Heidt M, Taborski U, Gerriets T, Roth M, Hein S, Urbanek S, Klövekorn WP. Reduction of gaseous microembolism during aortic valve replacement using a dynamic bubble trap. Gen Physiol Biophys 2006; 25: 207-214. Deslauriers J. Adjustments in cardiorespiratory function after pneumonectomy: Results of the pneumonectomy project. J Thorac Cardiovasc Surg 2011; 141: 7-15.